2 red Chile peppers rinsed, deseeded and membrane removed. 1 Heat the oven to 180°C conventional / 200°C fan assisted / 375°F / gas 5. 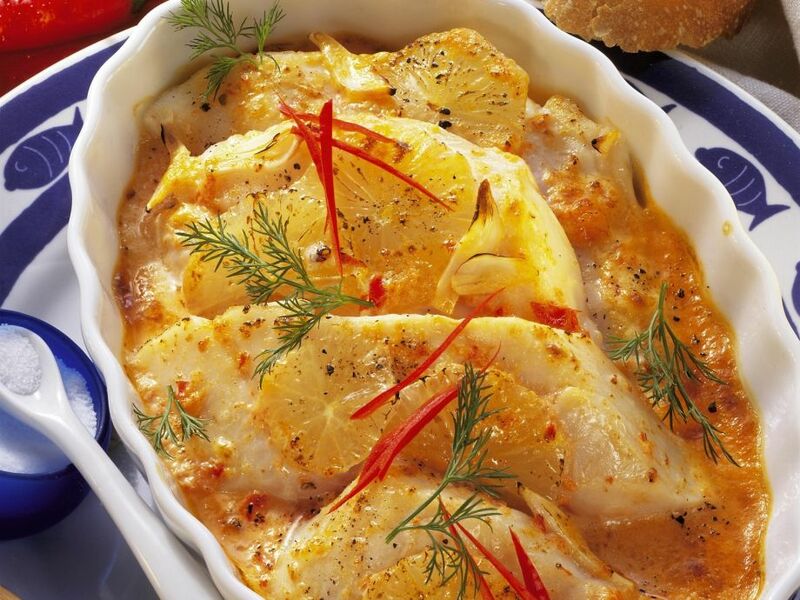 2 Lay the fish filets in an oven-proof dish with the lemon and garlic slices. Drizzle with olive oil and season with salt and pepper. 3 Chop one chilli pepper into fine strips and puree the other with the fish broth and eggs in a kitchen mixer. Season well with salt and pepper and pour the mixture over the fish. 4 Bake for around 25 minutes. 5 Scatter with dill and chilli strips to serve.